Decision making in instituting insulin therapy is an important aspect of diabetes management. The appropriate insulin regimen for an individual patient should take into account the patient’s lifestyle, age, motivation, general health, self-management skills, and treatment goals. 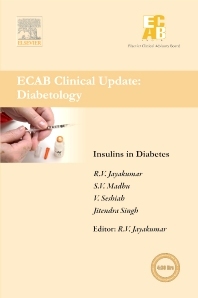 In addition, a discussion of the newer insulins versus older insulin is a much desired topic in the Indian context. Another area of interest is the insulin delivery mechanism in the intensive care units in hospital settings. This CME module is designed to address such questions with supportive typical clinical scenarios, with which all readers will be able to identify. Thus it provides an excellent opportunity to widen one’s perspective in this area. Dr. Jayakumar R. is a Professor at the Center for Nanosciences and Molecular Medicine (ACNSMM), Amrita Vishwa Vidyapeetham, Kochi-682041, specializing in the area of Hydrogels and Biopolymeric Nanomaterials. He has over 235 Journal publications, 10 book chapters and 10 patents to his credit. His publications have been cited more than 13300 times with h-index-60. In addition, he has also edited and published 4 books. He has received "Young Investigator Fellowship-2008" from Department of Science and Technology (DST), India. Recently Dr. Jayakumar received “Best Faculty Researcher Award” from Indian Chitin and Chitosan Society (ICCS), and “MRSI Medal-2017” from Materials Research Society of India (MRSI), India for his significant contribution towards biomaterials research. Additionally, Clarivate Analytics (Web of Science) honoured him with “India Research Excellence-Citation Awards-2017” in “Medical & Health Sciences” discipline.